As you can tell from my blog, most of 2015’s training and goals were centered around completing my first ironman, which happened in August. (Read here if you missed it). Since then my non triathlon life has picked back up with school back in session and my kids’ activities in their busiest seasons. 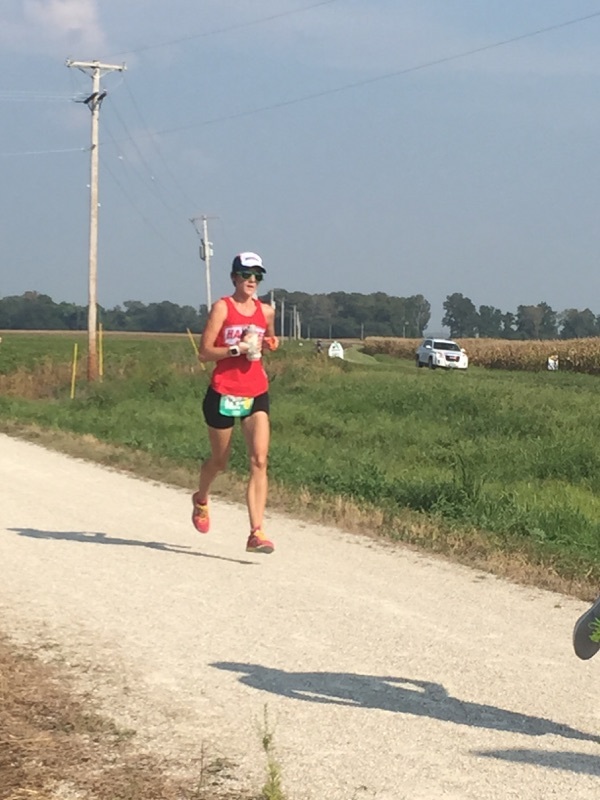 What I’m really proud of is that, so far, I’ve been able to stay pretty active despite a busy schedule and not having a big race on the calendar- both of which have been problematic for me in the past. I’ve added a day of strength training to my workout regimen and am really enjoying that. I’ve also been enjoying lots of workouts with my husband and my daughter. It’s fun to be out there just for fun, not worrying about specific distances or paces….for now! I’ve had a couple of events that were more for fun than something I spent months working towards. 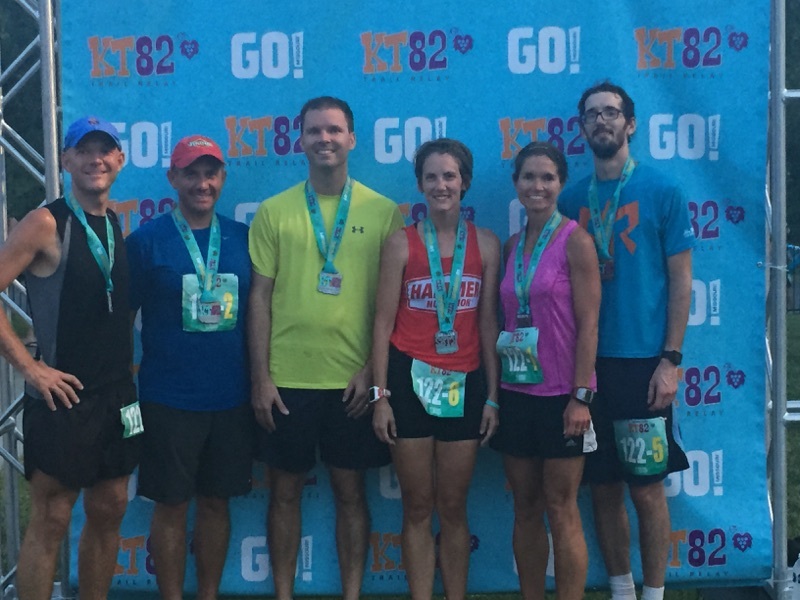 On Labor Day weekend, I took part in the KT82 relay race. 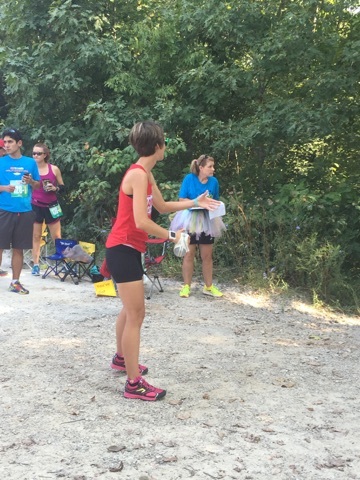 It’s a race run mostly on the Katy Trail in Missouri over, you guessed it, 82 miles. 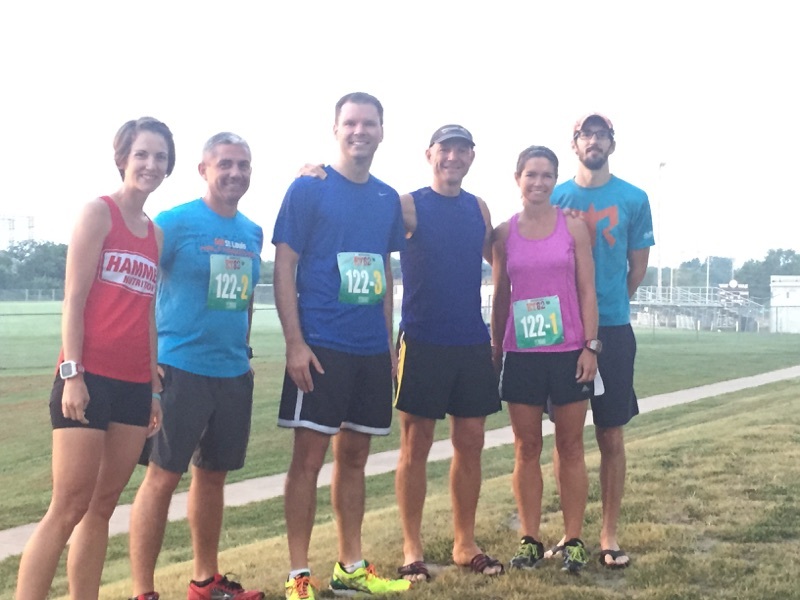 With a team of five other runners, we tackled the 100 degree heat. Some sections were true trail running, while others were completely flat crushed limestone where the biggest issue was baking in the heat of the day. I’d never done a relay event before and this was a fun experience. I was surprised at how little downtime I had between runs and ended the day feeling a lot more tired than anticipated. If you’ve never done a relay type event, you should- they’re lots of fun. The handoff to start my trail section of the day. A very hot time of day and no shade! 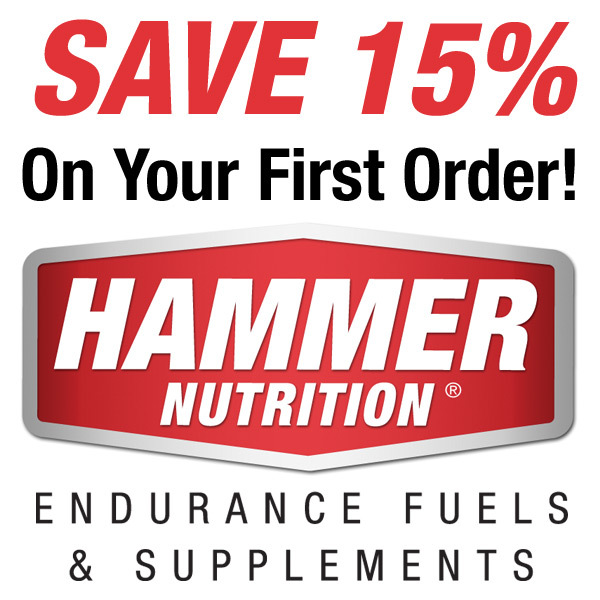 The following weekend I had the chance to race in Club Nationals at a race sponsored by Hammer Nutrition. 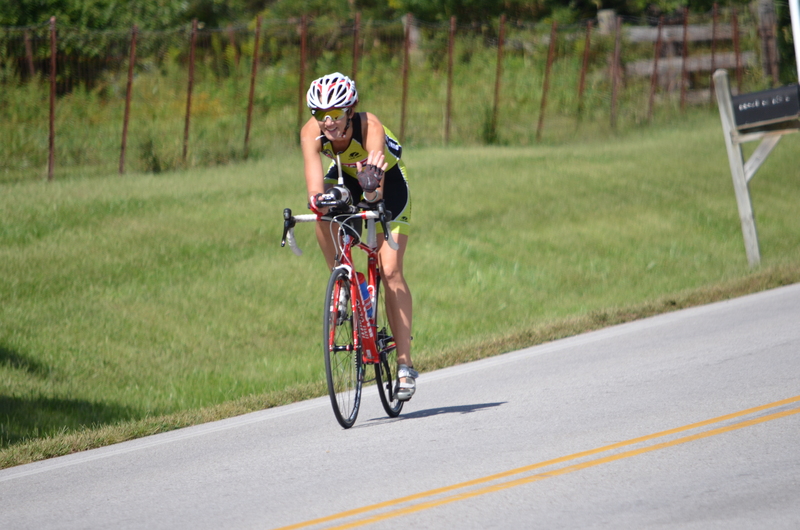 I originally planned to do the half-ironman distance but ended up changing to the aquabike. The course was absolutely beautiful. A calm swim was a welcome change from the winds at Legend 100 and the crowds at IM Boulder. The bike was hilly, I just didn’t anticipate how hilly. 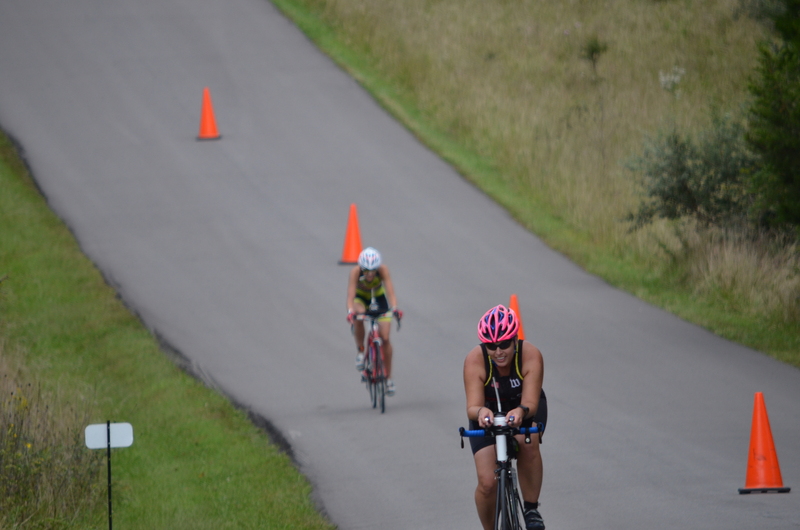 Had the distance been doubled to IM distance on the bike, I would have had more elevation change there than in Boulder. I enjoyed the race and would do it again, but could tell I’m not really race ready after Boulder yet. 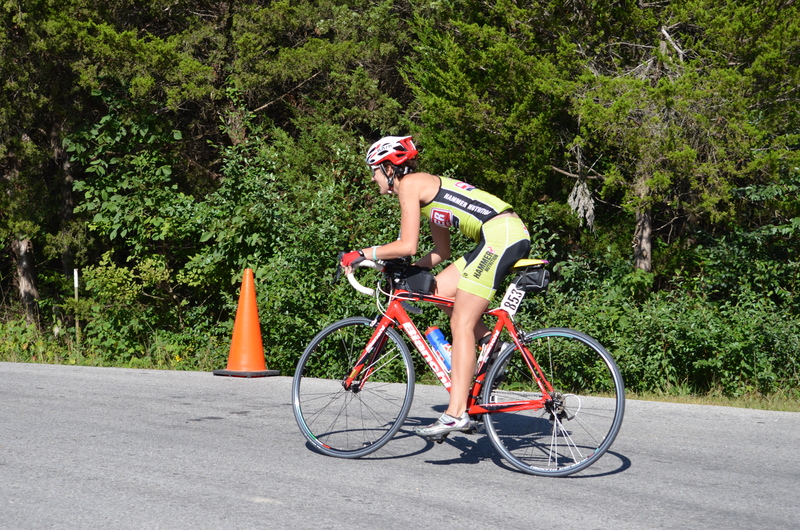 Regardless, it was good enough for 3rd place in my age group that day! My races for the rest of 2015 involve trail running, which should be a fun new challenge for me. I’ve run trails a handful of times and am quite slow at them, but I’m looking forward to spending more time on them and improving. My other big development is a group I’ve started at school in conjunction with GO! St. Louis. They have a program for high school students to train for a half marathon in April that I am implementing at my school. It is a really amazing program that offers kids who have never been active a chance to try it out and work towards a half-marathon. So far I have over 70 kids who have expressed interest, most of whom have never done sports or been active. I’m sure not that many will sign up, but I am so excited to get to lead these kids along this path. I hope they can all discover what a sense of accomplishment and self pride a goal like this can give them. I’m working on my 2016 goals, I know it will include a marathon or two, and a half-ironman or two. It’s crazy to think how fast 2015 has gone by! It’s amazing how long such a big effort effects the body isn’t it? Glad you’re still out there having fun. Look forward to hearing about the trail events. Yes, recovery is so different, I’m not sure I fully understand it! Rode SIUE trails today. Trails will be in my future for the coming months- on foot and on bike! I totally know what you mean! 2016 will be shorter distances for me. It’s definitely an adjustment to IM size workouts though.